As the National Football League (NFL) players begin their training camps, I have been fascinated by the league’s continued efforts to bridge the American culture in a bilingual and bicultural way to expand their fan base with the Latino community. In the past few years the NFL has partnered up with Spanish language networks to put together a foundational understanding of the generational, ethnic, socio-economic and regional difference that exist within the Latino community. The NFL educated itself to understand that Latinos are not monolithic, we vary by region, dialect and customs. With the help of its media partners, the NFL has been running Spanish language ads promoting Sunday as a time for family, unity and of course sports. Fox Deportes became one of the first Spanish-language networks in the U.S. to televise NFL games. For the newly acquired Latino fans who didn’t get enough football on Sunday, they can now catch Monday Night Football on ESPN Deportes. Locally, the NFL began sponsoring bilingual events at schools and tailgate parties. During Hispanic Heritage Month, the NFL runs ads highlighting Latino players and individual teams have also launched their own fan base programs such as “Vamos Bears”, sponsoring local pass, kick and run the ball events and handing out “De Todo Corazon” (with all my heart) Bronco t-shirts. The effort is paying off. Hispanics comprised 8.7% of the viewing audience of NFL games in 2014, up from 5.5% in 2004 (numbers for the partly-completed 2015 season aren’t available yet). That translates to 1.5 million people, a jump from 779,000 a decade ago. It’s still a small percentage of the U.S. Hispanic population, estimated at some 50 million, but no longer an insignificant piece of the NFL viewership pie. Naturally, the league has shifted advertising dollars in kind. During the 2014 season, according to Nielsen, the NFL spent $243.8 million on Hispanic media, a 60% increase over five years. Most of that is television, where ad spending rose to $230 million from $139 million. Hispanic fans tend to follow the same players as anyone else, too. The most well-known player in the market: Patriots’ quarterback Tom Brady, who scores an 84% awareness level among Hispanic consumers. He’s followed by the Manning brothers, Peyton and Eli (80% and 76% respectively), along with Reggie Bush (67%) and Richard Sherman (65%). The NFL has done a tremendous job at seeking to capture the hearts and minds of Latinos and Latinas. They realize that building a loyal following will take years and their efforts include speaking to Hispanics in Spanish and English and understanding the culture and nuances that exist within each subgroup. Not only will the Latino population continue to expand, so will their wallets. While these efforts have become commonplace for marketing agencies dealing with automotive, digital and beverage industries, it is still a relatively new field in public affairs, issue advocacy and community mobilization. As the population and income growth number show, our industry can’t continue to ignore this important group of voters, consumers, community leaders and decision makers – It is time for our industry to add its own Latino vocabulary. There is no doubt that Hispanics across the United States are eager to see what the GOP nominee has to say. 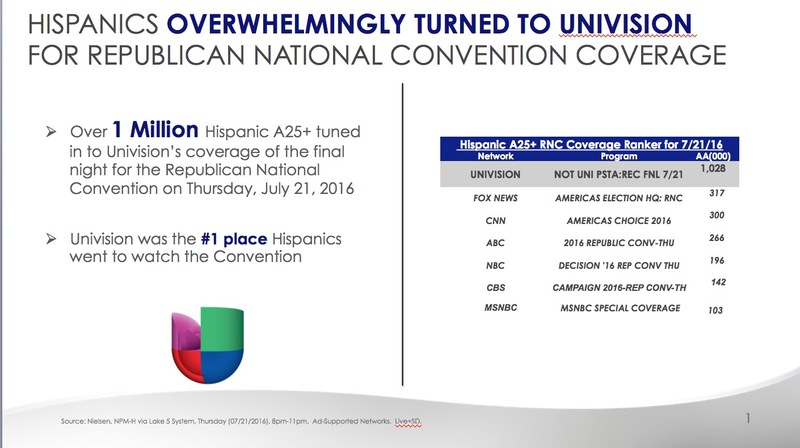 More than a million Hispanics aged 25+ tuned to Univision on the final night of the National Republican Party convention this past Thursday.